Dialogue tags can be one of the most useful tools in your toolbox, or they can be completely wasted words, depending on how you use them. Putting just a little thought behind which tags you use can make all the difference in the world. A dialogue tag – also called an attribution – is a small phrase, which usually tells the reader WHO is speaking. But it can tell us so much more. We’ve all seen dialogue tags that make us say “huh?” but my very favorite is one a friend shared with me. Here’s the sentence: “Don’t get your dander up,” Alice said, slangily. Slangily? Really? What exactly does that mean? So not only did this writer (I won’t mention which 1960s series of a young female detective it’s in) use a word that most people wouldn’t know, if it even exists, she also threw away a perfect opportunity to add a description or an action or even set the tone for the scene. In so many words, she wasted it. So how do we make dialogue tags count? Instead of a throwaway words, search for phrases that can enhance the story. Use strong words to accentuate what a character said. 1. Don’t use adverbs, i.e. –ly words. Example: “I don’t want to,” she purred. (Or hissed. Or sneezed. Or laughed. Or queried.) Unless you can actually say something while you’re purring or hissing or sneezing or laughing, your character can’t either. And, by the way, hissing involved the letter ‘s’. There MUST be an ‘s’ in the sentence to allow someone to hiss. 3. 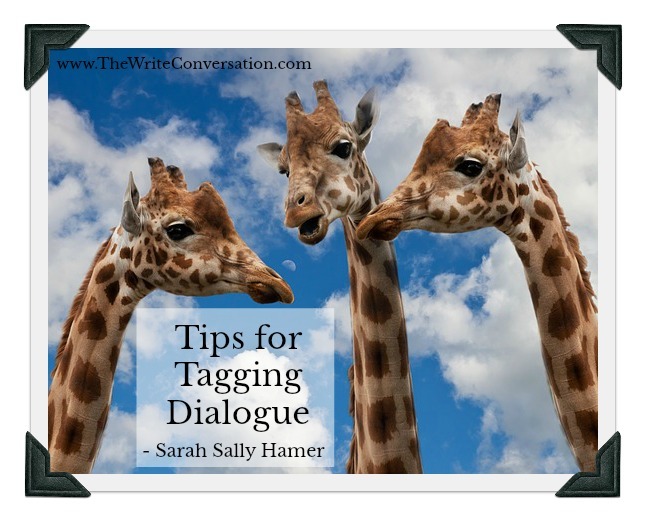 Do use dialogue tags to set a scene or add description. 4. Do use dialogue tags to add emotion. 5. Do use dialogue tags to add action. Do you see the difference? How much more information about your character can you shove into a simple “said”? It’s amazing how much! I’d love to see some examples of your dialogue tags. I bet you can do even better! Always amazing insight into the world of fiction writing. Thank you, DiAnn! I appreciate all you do! Thank you, Melissa. I learn better from seeing how someone else does something, then putting my own spin on it. Thanks! LOL!!! But it's very worth it, Chris! Good for you! Thank you, Ingmar. I'm glad you found something useful. Great information! I may have to rethink some of my tag lines. I love that there are so many choices to make a story stronger! Thanks for the comment!